Politics aren’t just for those 24-hour news outlets and social media this fall. Hollywood is gearing up for a politically charged Fall film lineup, movies ranging from the unabashedly patriotic (“Red Dawn”) to, by all accounts, the downright insulting (“Butter”). Here’s a handy guide to the films coming your way which may try to tweak the way you think about the government and the country as a whole. “Butter” (Oct. 5) – Jennifer Garner takes a swipe at Tea Party darling Michele Bachmann in this barely veiled attack on the Right. Garner plays the scorned wife of a conservative politician who enters a butter carving contest. “Won’t Back Down” (Sept. 28) – The battle between school choice proponents and entrenched teachers unions will get hotter when this Walden Media release hits theaters. It’s already causing panic with the president of the American Federation of Teachers, Randi Weingarten. And for good reason. The pro-school choice documentary “Waiting for ‘Superman'” may have started this discussion in theaters, but a fictionalized take on the matter featuring talented actresses like “Down’s” Maggie Gyllenhaal and Viola Davis could really cause a stir. “Atlas Shrugged: Part II” (Oct. 12) – Critics roasted the first installment, but a new cast and fresh sense of dedication will fuel the second part of Ayn Rand’s hugely popular saga. Will the box office triumph of “2016: Obama’s America” help goose interest in “Part II?” If not, the release’s proximity to Election Day will surely help, even if most mainstream media outlets are likely to ignore it as much as possible. “Killing Them Softly” (Oct. 19) – Brad Pitt’s latest star vehicle arrives in theaters with plenty of chatter about its anti-capitalistic themes. Pitt plays a hired thug tapped to investigate a poker game gone awry. Pitt’s liberal bona fides are firmly in place off screen, but he isn’t as divisive a figure as, say, Sean Penn or Tim Robbins. We’ll see how that image is impacted by the film. “Lincoln” (Nov. 9) – How could a movie recalling the universally popular 16th president be political? There’s a good chance it’s not, but given director Steven Spielberg’s ideological leanings as well as those of author (Doris Kearns Goodwin), upon whose work the film is based, and screenwriter Tony Kushner (“Angels in America”) anything goes. 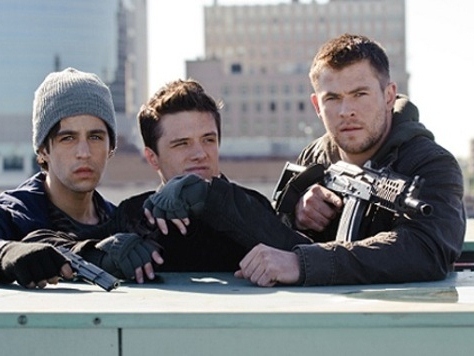 “Red Dawn” (Nov. 21) – Patriotism doesn’t sell overseas, they say. Tell that to “Captain America: The First Avenger” and “Battle: LA,” too unabashedly pro-American films which scored both here and abroad. Now, the ’80s war movie gets a modern day reboot, and even the film’s poster features an American flag. “Zero Dark Thirty” (Dec. TBD) – Potentially the mother of all political films this season became less explosive simply by shifting its release date after the November elections. The hunt – and killing – of Osama bin Laden remains the season’s hottest button issue, even if the filmmakers swear the movie isn’t anything but a tribute to the brave Navy SEALs who brought justice to the world’s most wanted fugitive.